Here it is – the acclaimed rock masterpiece, available on vinyl LP for the first time in 20 years. 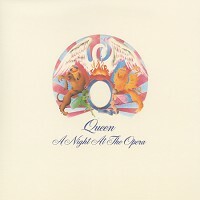 One of the truly must-own albums in all of rock history, A Night At The Opera features the monster hits "Bohemian Rhapsody," "You're My Best Friend" and "Love Of My Life" as well as the classics "39," Queen's ode to auto-erotica "I'm In Love With My Car" and their take on the British National Anthem "God Save The Queen" as well as the mind-blowing "The Prophet's Song." Every track on this album is a classic. This true extravaganza is now reissued on a glorious 180-gram vinyl long playing album, just like the good Lord and Brian May intended it. The beautiful classic cover features the raised crest and spot coating made legendary in the original release. This release is part of the "Queen on Vinyl" Collector's Edition reissue program – every Queen studio album is to be released on vinyl LPs over the next two years. The original albums are being reissued correct in every detail to the original releases, including inner sleeves, packaging and bonuses. Customer Reviews (4.67 Stars) 6 person(s) rated this product. Perfect replacement to the original!! All I have to say is, I had the original and this copy sounds better than it! Highly recommend! Couldn't wait to hear this Queen re-issue. One of the best albums ever. The re- issue is on quality vinyl and the sleeve and insert are all true to the first edition. The only problem is with the recording. The mids just aren't there. I hurried over try it out on a friend's high end system to make sure I didn't have an equipment issue. Same weak mid section. I then checked the original release and the mids are weak there too. So...not the remaster's fault - it seems the original studio engineering is at fault. Not a bad recording, but not knock-your-socks off either. Still gets four stars for the music. Excellent reproduction of the original. This is the definitive record from Queen to own. I ordered three of these--one for myself and two more for my kids. one or two had to be returned due to warping, but they sent back good ones and all played very well.